A free playable demo of Shadow Tactics: Blades of the Shogun is available on GOG and Steam. It gives a sneak peek by letting you try out the characters and their tactics through two missions. The full game is set to release on December 2nd for PC and in 2017 for consoles. Love it. It's Commando in a Samurai era setting. Exactly what I came back to post. I tried the demo and was sold on it from the first level. This is my type of game. Everything in this game just screams Commandos and Desperados, but in a Feudal Japan setting. Hell, even the enemies' green cones of vision, the color tone, and the geometric shapes in blind spots look straight out of the Commandos games. Makes me wonder if some of the developers are ex Pyro Studios' members. Developers don't hide the fact they've been obviously inspired by those previous games, but they came up with some additions. Also the story from Feudal Japan looks nice and I like it's exploring that era. I've played early access demo, think it's the same as now the public one on Steam. I didn't meant like it was a bad thing, much on the contrary, I really freaking love the Commando games, specially Behind Enemy Lines and Beyond the Call of Duty, I also love Desperados: Wanted Dead or Alive. The full 3D entries in these series are great games, but they just never retained the charm of the first games, which is why I believe Mimimi Productions chose to use the art design and visual style of them instead of going full 3D. My brother and I used to play them a lot and we still love them to this day. This genre, which one could call simply "Tactics" or even "Stealth Strategy" since it's in a much smaller scale than proper Strategy games - though it uses both strategy and tactics - and the air fighting games like Crimson Skies and the Jane's Combat Simulations are the 2 biggest genres that I most miss today. 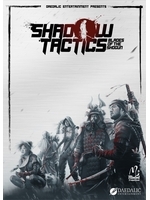 If Mimimi Productions has ex-Pyro Studios developers, then that just increase my enthusiasm for Shadow Tactics: Blades of the Shogun since I know their talent very well. If not, I'm still highly interested in it as it's a almost forgotten genre and any new games in it which brings new ideas or twists to old ones is automatically on my radar - I'm looking forward to it ever since the first reveal. While I didn't mention them before, one cannot forget the obvious inspiration to the Commandos and Desperados games, like the Syndicate and XCOM games. And the ones who also took inspiration from them like the Silent Storm and Jagged Alliance games - even though these 4 differ somewhat from the Commandos and Desperados games. So there's nothing wrong with inspiration, in fact that's how great games are made of, they build and improve upon the foundations of other great games.